Friends in Christ: For the five weeks of Lent we have been preparing for the celebration of our Lord's suffering and death. 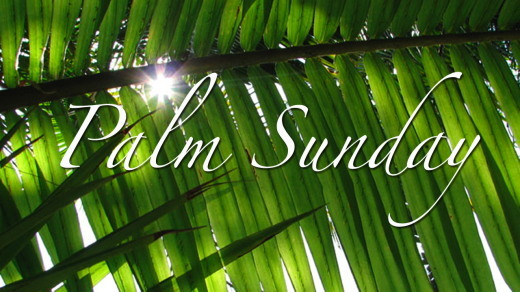 Today, together with the whole church, we begin this holy week by welcoming our Messiah. So, like the people of long ago, let us welcome Jesus and follow him to the cross. Lord, as we remember how Christ the King entered Jerusalem to the sound of joyful shouts, increase our faith and listen to our prayers, so that we may praise you every day, by living always in him. For he lives and reigns with you and the Holy Spirit, one God, now and forever. Amen. 22:14 When the hour came, he took his place at the table, and the apostles with him. 15 He said to them, “I have eagerly desired to eat this Passover with you before I suffer; 16 for I tell you, I will not eat it until it is fulfilled in the kingdom of God.” 17 Then he took a cup, and after giving thanks he said, “Take this and divide it among yourselves; 18 for I tell you that from now on I will not drink of the fruit of the vine until the kingdom of God comes.” 19 Then he took a loaf of bread, and when he had given thanks, he broke it and gave it to them, saying, “This is my body, which is given for you. Do this in remembrance of me.” 20 And he did the same with the cup after supper, saying, “This cup that is poured out for you is the new covenant in my blood. 21 But see, the one who betrays me is with me, and his hand is on the table. 22 For the Son of Man is going as it has been determined, but woe to that one by whom he is betrayed!” 23 Then they began to ask one another which one of them it could be who would do this.